If you are a Trinity Yacht owner, you know you belong to a select group of unique and world-class motor yacht owners. You understand you have a very special ship and you have very specific insurance needs that are not covered by standard marine policies. Your vessel is an extremely large investment, with extremely high damage repair and replacement costs. At PCI Insurance we have partnered with the carriers you need, and have the expertise required, to provide you with the world-class, mega-yacht insurance coverage you need, in order to protect your valuable investment. One of our primary carriers, ACE Group, has been a leading provider of yacht insurance for decades, and can offer some of the most comprehensive policies available for Trinity Yacht and luxury yacht owners with vessels valued at $5 million or greater. The Elite Yacht Program® is ACE's exclusive program to fulfill the specialty insurance needs of Trinity and luxury yacht owners. Trinity Yachts are exceptional yachts that require a specialized level of insurance protection. The Elite Yacht Program provides significantly increased benefit levels for a broad range of insurance coverage for your Trinity Yacht. ACE's unique Hull Deductible Waiver. Please see Coverage details below. A multitude of deductible-free coverages. Worldwide navigation limits are available. “Blue Cards” for Mediterranean cruising – required as proof of insurance in Italy, Spain, and Greece – free of charge. Hull Deductible Waiver – When a covered claim exceeds the Hull Deductible amount, no deductible is applied. Also see the ‘Deductible-Free Coverage' tab below. No depreciation applies on the following items: Machinery inside the hull; Personal Property; Crew Personal Property; Personal Watercraft. Occasional Charter Coverage – Our policy automatically includes this coverage. Medical Payments – The medical payments limit offered is on a per person basis, rather than per occurrence, and we will pay costs incurred up to three years from the date of occurrence. Captain and Crew Coverage – Liability coverage is extended to the captain and crew members serving aboard the insured yacht. Marina as Additional Insured – The marina, yacht club, and similar facility where the insured yacht is kept is automatically included as an Additional Insured. Mooring or Slip Rental Agreement Waiver – When waiver of subrogation is required through a written contract by a yacht club, marina, or similar facility used for the purpose of storage or slip rental, the Elite Yacht Policy will permit an insured to waive their rights to subrogation. 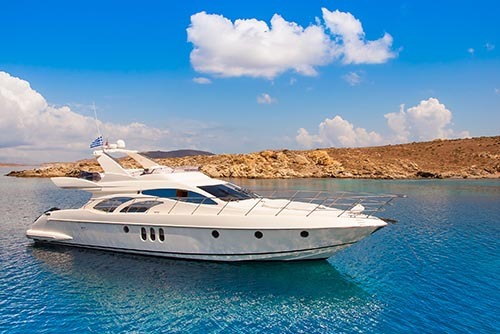 Legal Defense Protection – Covered payments made for the cost of an insured's legal defense, related to ownership or use of the insured yacht, are in addition to the Liability limit, up to a maximum of the Liability limit amount. Many other policies simply combine any defense costs into a single Liability limit, whereas the ACE Elite Yacht Program in effect provides an additional level of protection. Both of our other carriers, AIG and Chubb, also offer very attractive and customizable mega-yacht coverages for your Trinity Yacht or other luxury vessel, which can also be designed around your specific needs and cruising areas. No matter what type of mega-yacht you have, we have seasoned marine professionals at the top insurers in the insurance industry, ready to take care of your ship and make sure it is fully protected and covered. Property Coverage - Our comprehensive coverage not only protects your yacht in the event of a loss, but also covers items such as tenders, fine art, personal property, and furnishings at separate, lower deductibles. Protection and Indemnity (P&I) - We will pay damages that you or any other insured person are legally liable to pay related to bodily injury or property damage (up to the P&I limit on your policy). In addition, defense costs are covered above and beyond your P&I limit. Crew Coverage - P&I coverage for crew claims under the federal Jones Act or similar laws of other nations. Agreed Value - For boats insured for $1 million or more, or that are over three years of age, Chubb offers "agreed value", which essentially settles a covered loss before it occurs. Replacement Cost - If your watercraft is insured for less than $1 million and is three years of age or less, Chubb will pay the full replacement cost for a total covered loss. Emergency Towing and Service - For an emergency other than a covered loss, Chubb automatically covers the reasonable costs for towing and service for your watercraft and trailer. PCI Insurance is very proud to offer these specialized insurance coverages for Trinity Yachts, and we will be glad to discuss all of our Mega-Yacht Insurance options if your vessel is over 27' in length or has a value greater than $5 million. If you are a Trinity Yacht or other mega-yacht owner, or you represent a Trinity Yacht or other mega-yacht owner and you would like to find out more about how PCI can provide insurance coverage for your vessel, or schedule an appointment, please call us at 301-245-0130. We look forward to hearing from you.